DUBOIS – A local non-profit organization, First Class Children’s Foundation, is holding a unique fundraiser in the spirt of Christmas. This organization’s unique events raise funds to purchase school supplies for local children in need. For a small donation of $5, Santa will personally write your child or loved one a Christmas letter. 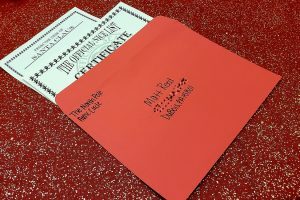 For a $10 donation, Mr. Claus will also include an “official nice list” certificate with the enclosed letter. For more information, please visit the organization’s official Web site at: www.firstclasschildrensfoundation.com.